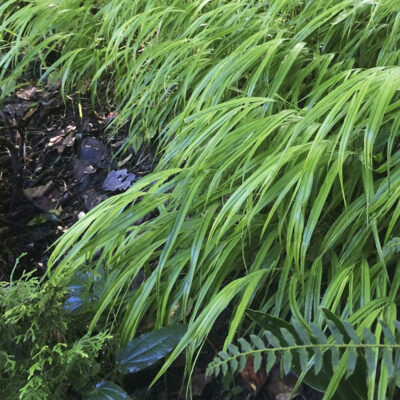 A graceful, elegant, spreading grass for the shade garden. Leaves are linear, apple-green and form dense cascading mounds. Tiny flower spikes in airy clusters bloom in summer. From areas around Mt. Hakone in Japan, it slowly and calmly spreads by rhizomes. Pair with ajuga and tiarella for a beautiful, zen-like garden experience. Trim foliage to the ground in late winter. Part shade. Height and spread 12-18”. Foliage will burn in full sun. Deer resistant. Zones 5-9.